The Reverend Carl Edwards of Vicar of Fairfield and Churchwardens Marion Wright and Pat Mellor admiring the re hung memorial tablet. Photo contributed. A missing link in the history of Fairfield has been restored. St Peter’s Church has re-hung a marble memorial tablet in memory of the Swann family - about whom it was once said: ‘There’s been a Swann in Fairfield as long as there’s been a Common’- which had been in storage for half a century. It was restored to its rightful place as part of the church’s Petertide celebrations. Removed in 1959 along with a section of rotten wood which was removed from the south transept wall, it marks the memory of the Swann family who were benefactors of Fairfield Church and the Parish for more than 300 years. The first name on the tablet is that of Joseph Swann, of whom little is known other than that he was born in Fairfield in 1806 and was the Village Schoolmaster in 1834. In the 1841 Census returns he was listed as Schoolmaster living in Fairfield Village with his wife and children, all of whose names can be found on the newly erected memorial tablet. It is possible that he and his family lived near where the Devonshire Arms is today where once there stood a row of single storey cottages. The school in which he taught would have pre-dated the North Road School built in 1862, with additions later and was demolished in 1977. Tradition has it that it was Joseph Swann who designed the existing 1839 church as the previous church building had fallen into disrepair. Joseph Swann died in 1843 at the age of 38. More is known about his youngest child, and only son Rowland, named after his great grandfather, a significant educational benefactor to Fairfield Church. Rowland Swann was born in 1837 and became an active member of the School Trustees from 1864 until 1893. One of Rowland Swann’s legacies to the area can still be seen today. 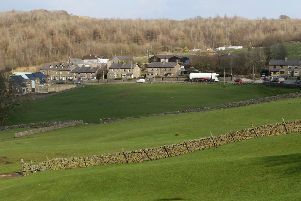 Rowland farmed at Lowfoot, a farm off Redgap Lane, Green Fairfield, until his death in June 1912. In 1895 following archaeological excavations by Micah Hall of the former Bronze Age barrow, trees were planted on the Great Low, known as Skeleton Wood, which can be seen across Buxton and beyond today almost 120 years on. The Reverend Carl Edwards, Vicar of Fairfield, said: “As a church community, we are delighted that we can replace this missing link with the history of the church in Fairfield. “We are also very pleased that the cost of re-hanging the memorial tablet has been paid for by a local historian, who is a good friend of St Peter’s Fairfield”.